I am a big fan of award ceremonies but I am even more keen when they celebrate TV and cinema as they are two of my other passions. Such was the occasion at last night's at 71st edition of the Golden Globes, which I live tweeted through the night. Award-wise, I was really pleased with most the recipients of the Globes – perhaps only Best Drama could have gone to a different film. Only two of the winners, however, have made it onto this year's best dressed list. In 5th place, Orlando Bloom in a midnight blue Lanvin number. I give him kudos for not choosing black and for opting for a skinny shawl collar jacket with an unconventional fastening. However, his shirt sleeves should have been altered and, c'mon, Legolas would never wear his hair so messy. 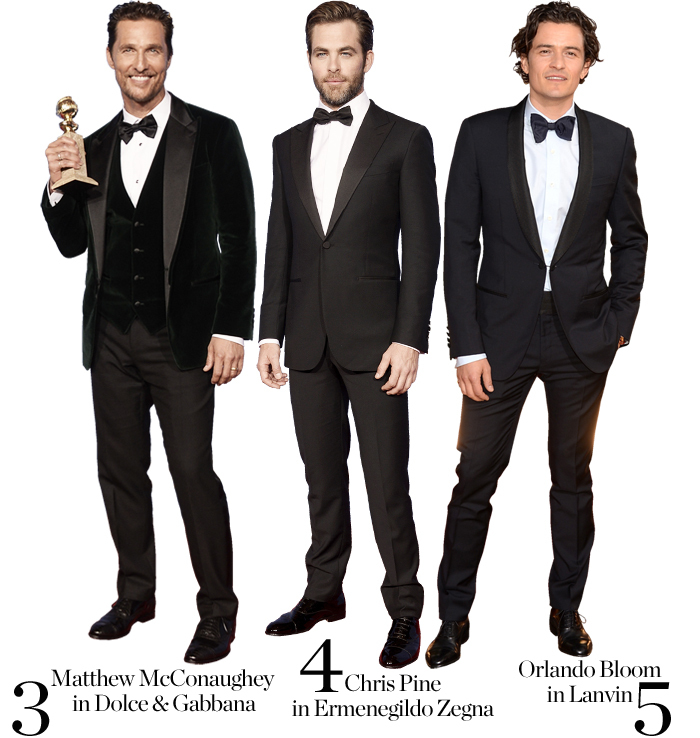 With a fit to perfection Ermenegildo Zegna tux Chris Pine gets 4th place. Only a slightly less traditional choice of tailoring and better grooming (shave your neck, man) would've rated him higher. Winner of Best Actor in a Drama for 'Dallas Buyers Club', Matthew McConaughey found the perfect balance between classic and fashionable in a three-piece Dolce & Gabbana suit in emerald-green with contrasting lapels. Almost at the top (believe me, I considered it at length) is Jared Leto, who also won an award for Best Supporting Actor in a Drama. Giving everyone much to talk about with his 'man bun', Leto looked really sophisticated in a slim Saint Laurent tuxedo accessorised with a silk scarf and his spotless beard. Who else but Bradley Cooper could be number one? Ever since he cut his hair the actor seems to be on a fashion roll. This classic and epically well cut Tom Ford tux is one of those things only a tall broad-shouldered man can pull off and, since it can't be me, I am glad it's Bradley.